The power of storms that blew through Euless Tuesday was caught on camera. 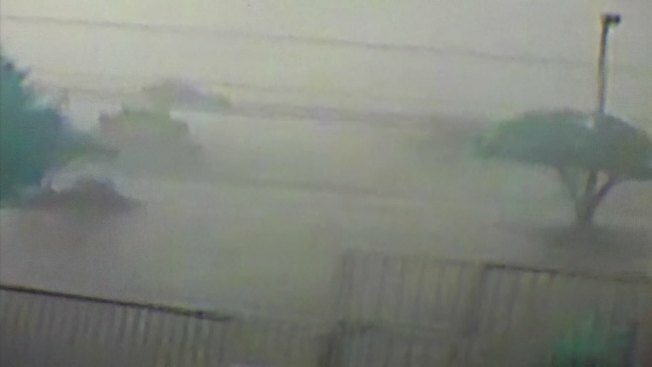 Surveillance video from B&B Wrecker Servic across the street captured the moment sheets of rain and high winds peeled the roof off Euless Gun and Ammo. "I've not been through a storm like that. i've lived here all my life and that was pretty scary," said Debi Chesney who owns B&B Wrecker Service. A blue tarp covers the area where the roof is missing. Chesney says she spoke to the gun shop owner and thanks to a second roof underneath the one that was torn off, the store only had a few inches of rainwater inside and minor damage.